Opened in 1986, the CHIREC Assisted Reproduction Centre (ARC) covers all areas of medical reproductive assistance and offers a full range of sterility and infertility treatments. 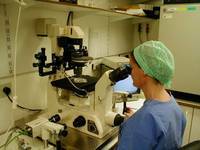 CHIREC has 20 years' experience in assisted reproductive technology and some of our physicians were involved in Belgium's first successful use of assisted reproductive technology back in 1983. CHIREC Assisted Reproduction Centre performs some of the most advanced treatment such as IVF, ICSI, IMSI, blastocyst culture, assisted hatching and vitrification of embryos and oocytes. Each patient's care is managed by an assisted-reproduction specialist who administers his or her patient's file, personally monitors the stimulation phase, collects gametes, reimplants embryos and oversees the luteal phase. Consultation times can be arranged to fit in with patients' work commitments. Psychological support can be provided for couples, however, they are not obliged to see a psychologist before infertility treatment. All treatment aiming to increase the chance of pregnancy is part of a process known as assisted human reproduction (AHR). Ovarian stimulation, hyperprolactinaemia and hyperandrogenism treatment, surgery to recreate integrity of genital organs fall under AHR in the broadest sense of the term. In the strictest sense of the term, however, AHR is limited to techniques involving at least one manipulation of the gametes such as intra-uterine insemination or the removal of gametes for fertilisation in the laboratory. Bernard Lejeune, MD, PhD, is currently the Director of the Assisted Reproduction Unit and Chair of the Gynaecology Department at CHIREC in Brussels and has specialised in reproductive medicine since 1982. He is member of the European Society for Human Reproduction and Embryology(ESHRE), the American Society for Reproductive Medicine (ARSM) and the Belgian Society for Reproductive Medicine (BSRM). He is currently President of the Belgian government's College of Physicians for Reproductive Medicine (responsible for monitoring and enhancing IVF procedures). Dr Lejeune has also published several papers on reproductive technologies in international peer-reviewed journals (Human Reproduction, Fertility and Sterility, RBM online among others). The team is composed by experienced gynaecologists and biologists.